As an adult, I’ve lived in some pretty cool cities – Boulder, Colorado; Washington, DC; and now, Boston – vacation destinations for many. As such, my friends and family have always assumed that I’ve spent all of my free time skiing in Colorado, exploring museums in DC and wandering the Freedom Trail here in Boston. Not quite. I like to say that no matter where you live, you still need to do your laundry and get your oil changed. That’s why it’s so refreshing when you have an excuse to explore your hometown like a tourist. It shakes up your regular routine and makes you remember why you call a place “home.” It can even stave off wanderlust until you are able to take a “real” trip. Stop 1: Cafe Paradisio – This cozy neighborhood cafe instantly transports me to Europe when I walk through the door, with dozens of football scarves hanging from the ceilings and old Italian men huddled over tiny tables with their espressos. 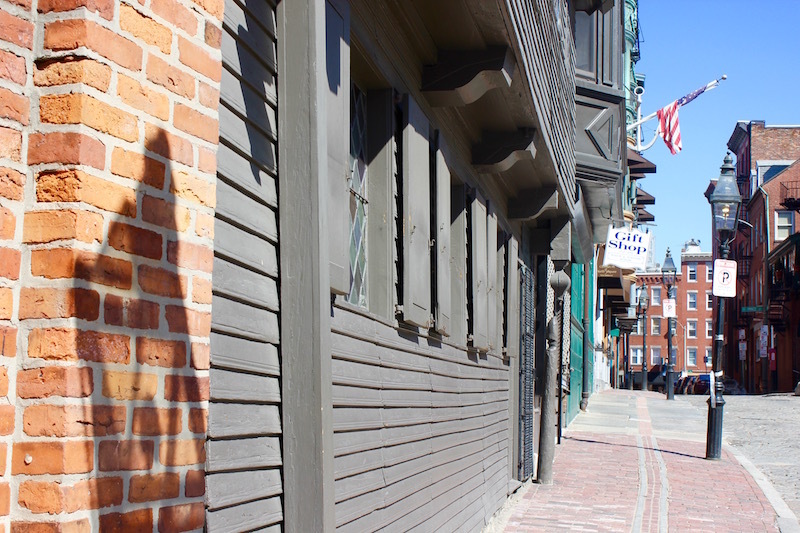 Stop 2: Paul Revere House – Built in 1680, this is the oldest house in downtown Boston. It only costs $3.50 to get in, and the tour is a quick one, but my guests decided to pass. Stop 3: Paul Revere Mall – A brick courtyard spanning between the chaotic Hanover St. and the rear of Old North Church, the Mall’s focal point is the Paul Revere Monument, by sculptor Cyrus Dallin. Stop 5: Copp’s Hill Burying Ground – This is the second oldest cemetery in Boston, containing thousands of graves and 272 tombs. Stop 7: Mike’s Pastry – Some Bostonians would say Mike’s Pastry has the best cannoli in Boston. Others would say it’s its rival across the street, Modern Pastry. Our group was pro-Mike’s. By car: Driving in the North End is difficult since the roads are narrow and congested, and there are a lot of one ways. Also, parking is usually hard to find, although there are several lots along the perimeter of the neighborhood. By taxi: I usually take an Uber when going to the North End. I always get out at the top of Hanover St. and walk, so I don’t pay to sit in traffic. By T (subway): There isn’t a T stop in the North End. The closest is the Haymarket Square Station stop (green and orange lines). You’ll have to walk for about 10 minutes to cross the Greenway and two major roads. Are there any other North End spots that you recommend? Copp’s Hill looks interesting – not everyday you would go to a cemetery. We actually have 4 right here in downtown Boston! It is a little weird walking by a cemetery on your way to and from work. The best kept secret of amazing destinations in Boston is the ‘Maparium”. Check it out. 7+ years living in Boston, and I haven’t been there yet! Thanks for the recommendation. Thanks! NYC is a great place to explore… I’m really excited to head down next weekend for NY Trav Fest. those are some great recommendations my hotel was by the cemetery but didn’t go in it and i found a few good coffee shops, Nero and Thinking Cup .went to the mikes pastry and had a brownie. Glad you got to explore the North End, Lorrie! It’s a special place with lots of amazing food! I love the idea of “exploring your hometown like a tourist.” I’m sure we all have amazing places to visit in our own backyards. Excellent reminder!